There’s No Getting away from Toys! Kids love their toys. So, there’s no getting away from toys if you have kids in your house. But with toys, comes mess. It can get quite tricky to manage all the toys collected over the years as your child grows up, simply because they don’t want to throw any of those away, ever! A simple solution, can take care of this for you – Great Useful Stuff Collapsible Toy Chest! Medium sized toy chests just don’t work. That’s why, you are going to find these toy chests are incredibly useful, because they are much larger (by up to 40%) than other toy boxes available at this price. At 30x15x16 inches, these have a storage volume of 7200 cubic inches – large enough to store all the toys with all their accessories. Moving away from the uninspiring designs of toy storage bins of old times, we’ve made sure that this toy chest looks attractive & gets the job done without any fuss. It’s strong, sturdy & elegant with smooth surfaces. Its collapsible design makes sure that you can easily fold it flat & tuck it away under the bed or in the closet when not in use. This toy box uses lightweight & durable 600 Denier Nylon, making it easy to wipe clean & carry. With strong, built-in handles & powerful loop and hook closures that accompany the flip-flop lid, you can haul all the toys around without breaking a sweat. Time to bid goodbye to playroom mess & scattered toys. Just click the ‘Add to Cart’ button & order the best toy chest right away! CARRY IT ANYWHERE -- We have made sure that this simple solution to all the toy-mess in your house is easy to carry anywhere & everywhere - thanks to a pair of built-in handles, in addition to amazingly powerful loop and hook closures & a flip-flop lid! 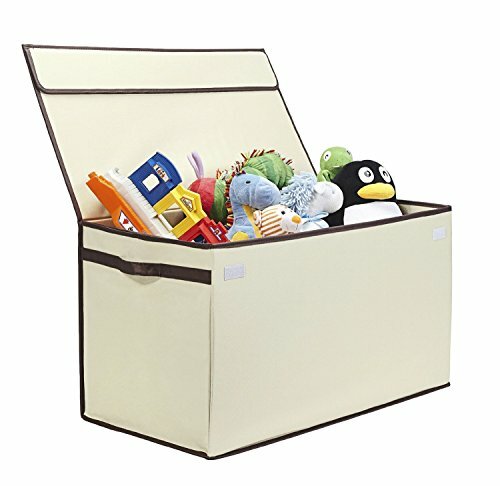 WASH WITHOUT A HASSLE -- These toy chests use 600 Denier Nylon fabric that is lightweight & durable - What's more, you can easily wipe it clean without worrying about water damage! No need to litter toys around - just click "Add to Cart" & order the largest & strongest toy chest out there right now!